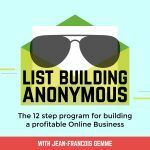 In the second part of this step towards building your own profitable online business, Jean is joined by special guest Alvaro Baturone; A personal coach in the relationship niche helping people overcome emotional obstacles and creating a fulfilling life. Alvaro goes into great depth about how you can harness the strengths already inside you, and then use them to evolve and thrive to live life to your fullest potential. Previous post: Are You Making These 5 Deadly Email Subject Line Mistakes?